1 of 6 Heat broiler. Coat broiler-pan rack with nonstick cooking spray. Soak twenty 6-inch bamboo skewers in warm water for 15 to 20 minutes. 2 of 6 Meanwhile, in batches, cook bacon in skillet over medium heat 3 to 4 minutes, until still flexible but lightly cooked. Transfer to plate; let stand until cool enough to handle. 3 of 6 Mix salt, allspice, cloves, black pepper, cinnamon and red pepper in small bowl; toss 1 teaspoon with shrimp in medium-size bowl. 4 of 6 Spread 1 strip bacon on work surface. Top with 1 shrimp; tuck pearl onion into curl of shrimp. 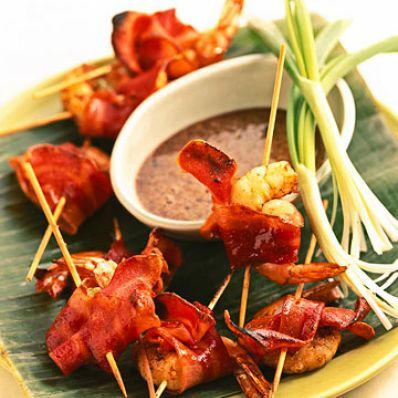 Wrap with bacon to enclose shrimp and onion; secure with soaked skewer. Repeat with remaining bacon, shrimp, onions. 5 of 6 Whisk together corn syrup, maple extract and vanilla in a small bowl. Stir in remaining spice mixture. Divide in half; set half aside for dipping. Brush some of remaining syrup mixture over bacon-wrapped shrimp. 6 of 6 Broil skewers 1 inch from heat, for 3 minutes. Remove from broiler; carefully turn over. Brush with any remaining syrup mixture. Broil another 3 minutes or until bacon is crispy and shrimp cooked through. Serve with reserved syrup on the side for dipping. Makes 20 skewers. Per Serving: 399 mg sodium, 6 g pro., 104 kcal cal., 5 g Fat, total, 10 g carb., 0 g fiber, 1 g sat. fat, 40 mg chol.